ThoughtWorks creates the Technology Radar to help champion the cause of software excellence and revolutionize the IT industry. Because we have lofty goals, this is an intentionally opinionated document that is meant to challenge us all to improve. 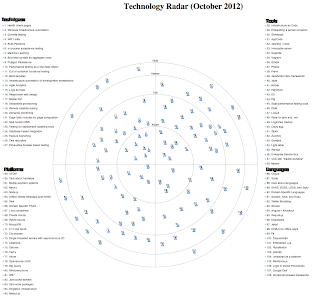 The radar is created by the Technology Advisory Board (TAB). It is a group of 21 technologists from around the world that includes Martin Fowler -our chief scientist, Rebecca Parsons - our CTO, Neal Ford - a prolific author and speaker, and Pramod Sadalage –author of NOSQL distilled and Refactoring Databases. This group brings together a cross-section of technologists with very different interests and focuses. We meet in person every 6 months to focus on technology strategy for our company and the IT industry as a whole. The radar is one of ways that we share that strategy. 1.5 hours of heated discussions about topics ranging from problems with Rails to emerging cloud providers. Brainstorming hundreds of items that we are interested in. Discussing the relative importance of these items and how they affect different parts of the world. Choosing the most important items. Deciding how to advise our consultants and the industry as a whole about these items. As you can imagine, those are some heated discussions, because we have 20 technologists working on very different projects with very different constraints. 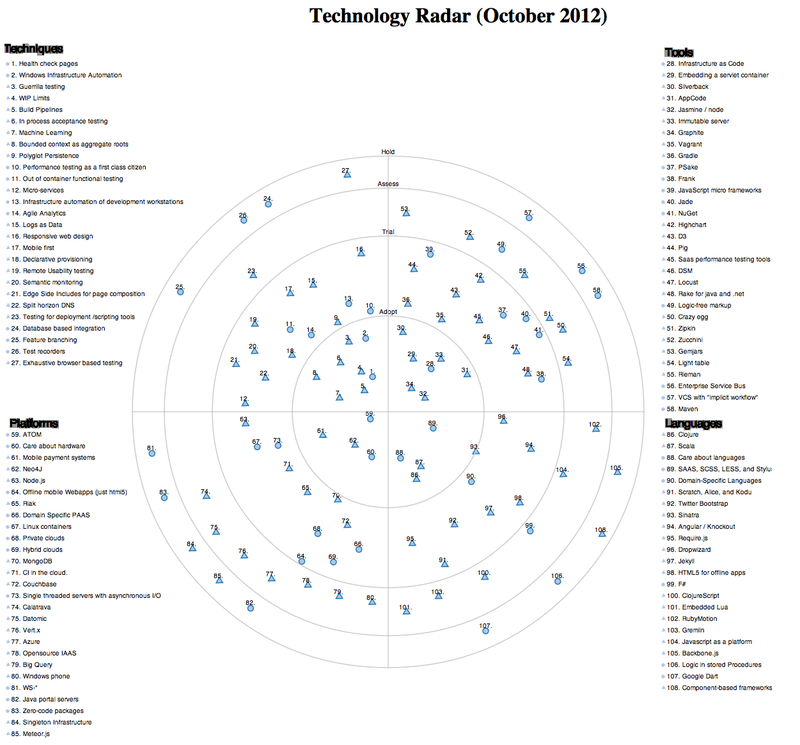 After the face-to-face meeting, these discussions are transformed into the document you know as the Technology Radar. We start by picking out items that each member is most knowledgeable about. They do some research to deepen their understanding. This research usually involves discussions with other ThoughtWorkers and our friends in the industry. They write up a paragraph that captures their thoughts about each item. We sort the items and rewrite the descriptions to have a uniform voice and appropriate length. We work with our graphic designer to make the document look professional. Because of ThoughtWork’s flat organization structure and open culture, we are a group that works out in the open. For us that means our discussions are held on mailing lists that are open to any ThoughtWorker. Early drafts of the radar are shared and we actively encourage discussion and even disagreement from everyone.